Picture a Day - The Holy Land Revealed: Where Is "Tell Pioth?" 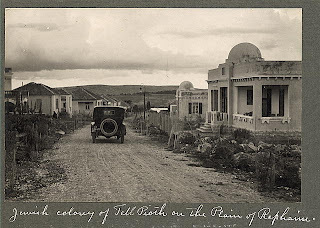 ﻿This pastoral picture from the Library of Congress collection bears the date 1925 and the caption, "Jewish colony of Tell Pioth on the Plain of Rephaim." It may take a few seconds for anyone who knows Jerusalem to realize that the picture is of the Talpiot neighborhood in southern Jerusalem. The "Plain of Rephaim" is the continuation of the "Emek Refaim" Road in Jerusalem's German Colony. Trees, gardens and small houses such as those in this picture. Yosef Klausner lived there too and his library was destroyed in the 1929 Pogroms (here) and you can see a picture of Agnon's house here.